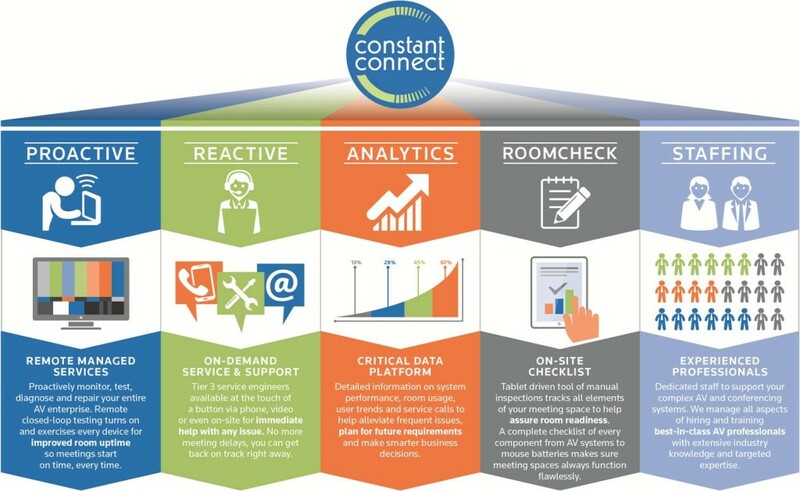 Constant Connect is a suite of managed services that assures room readiness for high profile meeting rooms. This means no more frustration from user and technical problems that occur during a video conference or presentation. The suite includes Proactive Services that can identify and solve issues before meetings even start, Reactive Services that provide immediate support at a touch of a button and RoomCheck, a checklist to ensure all rooms function flawlessly every time. All services include our Analytics Portal, an easy way to track performance, usage and issues to help you make more informed business decisions. Constant Connect lets you be sure that everything from equipment to connectivity to remote controls in your high profile meeting rooms will be ready to work at a moment’s notice.